Healthy ageing Archives - Seven Countries Study | The first study to relate diet with cardiovascular disease. In elderly men of the FINE study a decrease in average physical activity over time was associated with a greater cognitive decline than in those maintaining physical activity. APOE4 carriers with a low level of physical activity are particularly at high risk of cognitive decline. In elderly men from Zutphen, a low (<1 hour/day) compared to a high (>1 hour/day) duration of physical activity was associated with a 2-fold greater cognitive decline. This decline was twice as great in APOE4 carriers. In middle-aged men from the Seven Countries Study the additional relative risk of death within 15 years varied for seven chronic diseases from 47% for ‘other’ heart disease to 81% for heart attacks. In older men the additional risk of death for any chronic disease was 95% in Finland, 88% in The Netherlands and 27% in Italy. The risk of death with an entry class of 3 or more chronic diseases compared to their absence was more than 3 times greater in elderly men from Finland and The Netherlands and 2 times greater in Italy. These results indicate that the presence of clinically manifest major chronic diseases predicts all-cause mortality and the relation is stronger in northern than in southern Europe. The scrutinized diseases were heart attack, heart failure, stroke, peripheral arterial disease, other heart disease, diabetes and chronic obstructive pulmonary disease. Longer telomeres at baseline did not predict all-cause and cause specific mortality after 7 years of follow-up in the elderly men cohort from Zutphen. The cross-sectional mean telomere length decreased from 5.03 kbp in the 1993 survey to 4.76 kbp in 2000. Telomere shortening is a marker of ageing that might be related to oxidative stress. [/glossary_exclude]Telomere length was measured in leucocytes by polymerase chain reaction in men who participated in the Zutphen Elderly Study. Within the cohort, telomere length measured in 1993 and 2000 was strongly correlated. Telomeres are nucleoprotein structures at the end of chromosomes. They prevent chromosomal ends from being recognized as double strand breaks and thus apparently protect them from end to end fusion and degradation. In elderly men from Finland, The Netherlands and Italy, age, smoking and heart rate were positively associated with excess 10-year all-cause mortality. The association of systolic blood pressure with all-cause mortality was marginally significant at 10 years. HDL-cholesterol and body mass index were significantly inversely related to all-cause mortality after 10 years of follow-up but these associations were no longer significant after excluding early deaths (during the first 5 years of follow-up). These results suggest that smoking and heart rate (an indicator of physical activity and fitness) remain useful risk factors in prediction of all-cause mortality up to old age. Elderly men from Finland, The Netherlands and Italy (the FINE study) whose cognition declined in the preceding 5 years, had a 2-fold greater risk of dying in the subsequent 5 years. 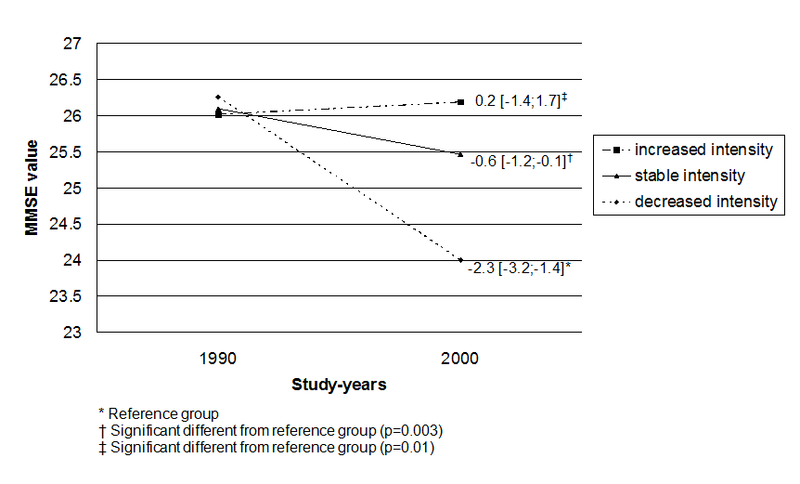 The mortality risk of the men whose cognition improved between 1990 and 1995 was not different from those whose cognition remained stable. 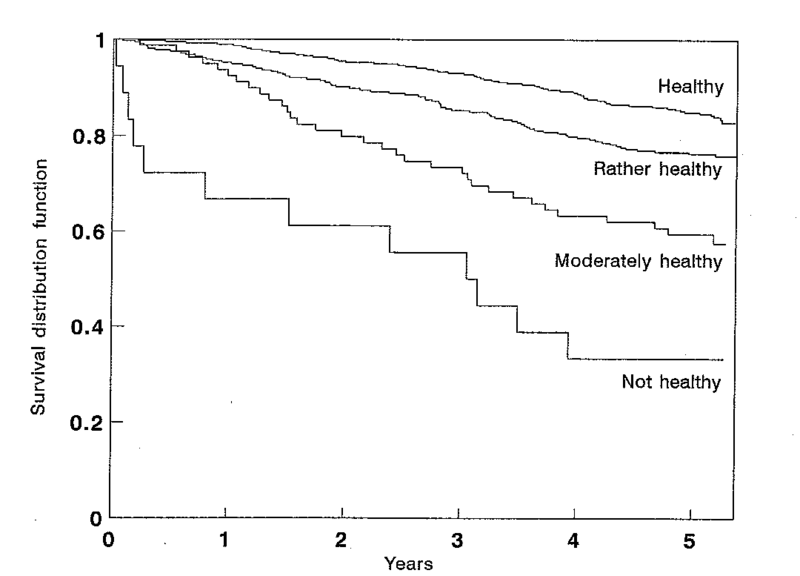 At the start of the mortality follow-up in 1995, the survivors in 2000 were younger, had a better cognitive function, were more physically active and were less disabled. They also had a lower prevalence of heart attacks and cancer than those who died during the 5-year mortality follow-up period.